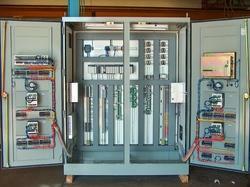 We are a leading Manufacturer of electrical control panels from Ahmedabad, India. Our clients can avail from us different range of Electrical Control Panels which are manufactured from high quality components. It is designed according to the industry quality standards which ensures its accuracy and durability. It requires less maintenance and available at industrial leading price. Our panels are widely acclaimed for its simple operation and electricity saving attribute. We also manufacture it as per customer configuration. Looking for Electrical Control Panels ?